Market research firm iSuppli believes Apple products such as the iPhone will create insatiable demand for NAND flash memory in 2010, and will help to strain supplies for the year. 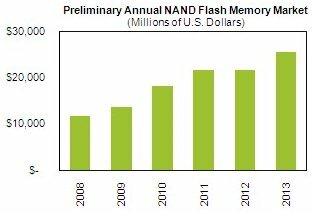 Partly owing to demand driven by the iPhone and competitive products, global NAND flash revenue will rise to $18.1 billion in 2010, up 34 percent from $13.5 billion in 2009, according to a preliminary forecast from iSuppli. This compares to a 14.8 percent increase in 2009. Partly because of increasing shipments of the iPhone and the arrival of competitive smart-phone products, the number of mobile handsets that contain embedded NAND flash is expected to rise sharply in 2010. iSuppli forecasts that shipments of mobile handsets with embedded NAND flash will grow to 732 million units in 2010, up 13.8 percent from 643 million in 2009. This compares to marginal growth of 1.6 percent in 2008. Beyond the smart-phone segment, a number of other promising products are driving the NAND market in 2010, including eBooks and tablet PCs. However, while eBooks such as the Amazon Kindle may follow a similar growth path as Apple’s iPods, they don’t use nearly as much NAND flash memory. eBooks contain a mere 512MBytes to 2GBytes of embedded NAND included in each device. And although density will no doubt grow in the coming years as wireless Internet enables more features and functionality, NAND usage in eBooks will remain low in 2010, iSuppli predicts. Tablet PCs—with an anticipated storage density of 32GBytes to 64GBytes of storage—represent an attractive opportunity for NAND suppliers. However, it remains unclear if volumes will reach the projections of hopeful manufacturers. The introduction of Apple’s iPad, though, might boost the market, and if the adoption rate for the iPad that approximates those of the iPod and iPhone could be a serious market-changing segment for NAND vendors.